The Library will be hosting author and paranormal investigator James Willis for two presentations this summer. Mr. Willis is the founder of Ghosts of Ohio, a nationally recognized paranormal research organization. In addition, he has written or contributed to numerous books about spooky or strange places and events, including Weird Ohio and Haunted Indiana. His program “Meet the Ghosts of Ohio” will be held at the Main Library on Tuesday June 19 at 7 p.m. 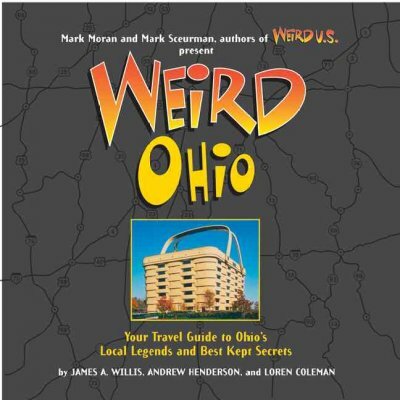 He will then return to present “Weird Ohio” at the Orange Branch on Wednesday July 26 at 7 p.m. These should be a lot of fun. Library’s Summer Reading Club Kicks Off This Weekend! School’s out, so it must be time for the Library’s Summer Reading Club! The program officially kicks off this weekend at all locations, and along with snacks, prizes and entertainment, you can register to be part of the amazing program the Library’s Children’s Department has developed and prepared. Kick -Off Parties will be at the Ostrander and Orange Branches tomorrow, and feature award-winning musician, author and child development specialist Jim Gill. You can see him perform at 11:00 a.m. at the Ostrander Branch and at 2:00 p.m. at the Orange Branch. Jugglers Dave Kaplan and Matt Jergens will be at the Delaware (Main) Library and at the Powell Branch respectively, at 2:00 p.m. to kick off the Summer Reading Club. Along with programs for children from infant to 12-year-olds, the Summer Reading Club also includes teens and adults, with programs, prizes, and fun. You can sign up for the Teen and Adult Reading Clubs online beginning tomorrow, to start reading and claiming your prize. Any book you read in any format (eBook, audio book, paperback, hardback) counts so start today! And, of course, there is a great line-up of programs for teens and adults, too. Participating in the Summer Reading Club is fun, but it’s also educational (shhh, don’t tell the kids!) because it will help them hone their reading skills and keep them sharp throughout the summer and into the next school year. And for the little ones who are not yet reading, the programs presented by our talented and knowledgeable children’s staff will help them to learn how to read and begin to prepare them for kindergarten. We invite you to DREAM BIG–READ! this summer at the Delaware County District Library. I hope to see you and your family often throughout the summer.